Ok people i am gonna make this simple i don´t like skiping from post to post so from now on try to discuss the stuff you want to discuss about the Ending of Naruto Here. It is to much trouble for me and for You if we all skip from post to post everytime and end up without knowing what to conversation was going on plus i like to see with my own eyes where this discussion is going. Also want to know everyones opinion about it i am from nature a curious person. KEIRYU MASTER OF INSANITY...out (Currently just seeing where this will go. Chriskris Hmm, the others all stopped watching after S1. Chriskris Yea, Kishi should have maked this pair. Then Naru or Sasu just adopt a child. And learn that child all those UBER Jutsu's. Chriskris Actually I loved Naruto. Becuz it's was different from the other shounen Anime's. 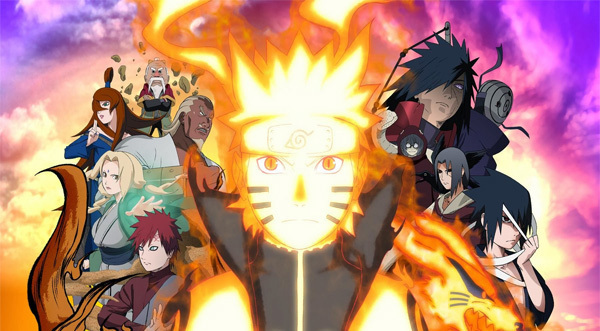 Naruto itself wasn't about i'm stronger then u so i;m the winner. The Genin to Chuunin Exam was so OP. Any the fight about Naruto versus Neji. Anyway, but after Shippuuden comes out. All those Epic Tactic battles was over. And then it was all about power. And the five elements. Fire>Water>Earth>Wood etc. And remember when they first said that Sharingan was bloodline jutsu. And then MANY ppl are scared of Sharingan becuz it's OP. But the funny thing is, Sometimes u met a boss who is scared of Sharingan. and the other beat them w/o any problems at all. Why didn't they upgrade Byakugan? Well. That's also a point that I disliked Shippuuden. Keiryu As for Tenten not being important i would not say that she is just as important as the rest of Team Gai she might not have that much to say compared to Neji or Lee but she is just as important in my opinion it´s the little characters that make something truly special. Her fight against Temari was also more bad luck then anything she is a weapon expert up against a Wind user every weapon she would have thrown end up flying back if the story had been better planed by Kishi he would have given her the ability to manipulate chakra strings( You know the stuff Kankuro uses on his Puppets) to manipulate weapons (If That old Fart Chijo did it with Sakura then Tenten should be able to do it with weapons). Also on the Elements it´s Fire - Wind - Lightning - Earth - Water. Every other "Element" is just a combination of one or more Wood = Water and Earth. Ice/Snow =Water and Wind and so on. Sharingan part i said this before but Kishi is just a Uchiha fan sl*t and as for the byakugan i guess it did not get any upgrade since he had to many Hyugas or maybe he was just lazy. for the Fights ending up becoming more power that i have to agree every fight ends the same "Oh no enemy to strong quick call Naruto and let him use the Super Mega Ultra Plotdevice Rasengan" and then they win. on another random note i just noticed it was not enough to give Sasuke The Eternal Mangekyo Sharingan (You know that thing that is almost invincible), The Rinnegan (The even more invincible version of the Eyes), A fully complete Susanoo but he even gave that Susanoo the ability to use Natural Energy/Sage Mode....I CALL BULLS**T ON SO MANY LEVELS!!! There is a limit to how much you can overpower a character without good reason i mean Naruto got the tailed beast but dude had to fight again all of them (Not counting the 8 Tails) and he got Sage Mode but he had to Train being nearly turned into a frog in the process. Chriskris NARU X SASU is the BOMB! I'm gonna e-mail Kishi. and tell him to rewrite the last chapter! And it must be NARU X SASU!!! Becuz WE ALL KNOWS THAT SASUKE LOVES NARUTO. After episode 3 or 4. Don't rly remember. Chriskris Hmm, we have been skipping from this to that pic since an hour ago. Keiryu Yeah but here it is easier if we collect it in one Post. so try to do it in just one post. And while i am at it like you said Sai might be not as important as other characters but he should still be allowed to have a girl in my opinion and i say he fits with ino just because Shika fits better with Temari. And the whole choji mindf**k happend. If I have to start from the start in my opinion a few character died in my eyes. But ok, I also exclude that part. Since everyone is alive and gets a girl. But why does Sai gets a girl and Kiba, Shino, Akamaru doesn't have a patner? What makes him MORE important then the rest? And also suddenly out of nowhere... Why does everyone MUST have a patner??? I could life with it if Sakura, Ino, Sai & Chouji was still Single. It's so rushed at the end. That I can't agree with it. Keiryu Actualy Akamaru is seen with a bunch of Puppies near him at the end so i am guessing he got some too just guessing tough plus we don´t really see that many Dogs other then the talking one from his Mother and the 3 from his sister and Kakashi´s Summons and as far as i know none of them are bi*ches(Technical term for a female dog ;D). So who would you want him to have? Keiryu I agree it is very rushed at the end and yes they did not need to have everyone with someone. Chriskris Why hating on Akamaru? He needs a to make love too. But yea. all those female side characters have a patner. Well, if they gonna pair everyone up. Let's pair kakashi and Ayame. Keiryu People Do me a Favor Discuss it here to much trouble if we all skip from post to post. Chriskris And it makes me lose what i've said before and what I have yet to say. It makes me reply my text over & over.